Offering a complete line of industrial janitorial supplies, New Day Packaging Products is a dependable supplier for multiple industries. We feature all of the products necessary to keep an organization clean and presentable. Our high-quality towels are both economical and durable, providing enhanced performance in demanding environments. They work great for bathrooms, kitchens, and other areas of a facility where efficient and fast drying or wiping is a necessity. Available in bulk quantities, we also offer a full range of dispensers that can accommodate multiple sheet sizes and roll shapes. Our wipers are engineered for prolonged cleaning of oil, lubricants, water, and solvents. They can handle any messy job, providing general purpose absorption for industrial strength fluids. When there's a need for quick and convenient adhesives, our glue dots, glue sticks, dispensers, and adhesive sprays offer exceptionally strong bonding to metals, plastics, wood, rubber, paper, and laminates. Many of our adhesive sprays can work under various temperature conditions; offering dependable bonding performance when used in industrial settings. Finally, we carry both manual, automatic, pneumatic stapler products. Our handheld staplers work great for both general use and shipping cartons by providing increased leverage and good driving force. With our pneumatic staplers, our customers can increase productivity using a simple one-handed operation that drives air-powered staples into cartons with forces as high as 80 psi. 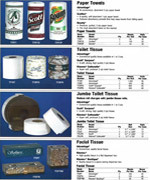 We carry supplies for virtually any janitorial challenge, offering products from trusted brands in the industry.